Most vampire and werewolf mythologies assume that these creatures have been in existence for millenia. In fact, the origins of these creatures is generally not addressed at all; it is simply taken for granted that they exist and the narrative moves on. 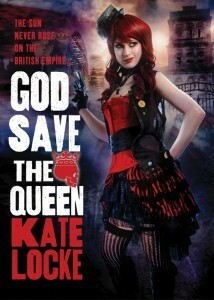 In God Save the Queen by Kate Locke, this vampire, werewolf and goblin issue is a relatively recent development. Having dealt with the Black Plague time and again over the centuries, the immune systems of humans, especially nobility, have adapted in strange ways. As explained in the 'Understanding the Aristocracy' appendix, the two variants of this adaptive ''Prometheus Gene' can cause either vampirism or werewolf traits when two copies of the same variant is possessed.Having one set of either gene gives the person some of the physical benefits, such as increased strength and stamina. And possessing one of each gene creates a monster that is discarded by civilization. Thankfully, due to extensive gene typing, these accidents are quite rare. Alexandra Vandry is a Halfsie. She's the daughter of a member of the Aristocracy and a courtesan selected for her ability to produce viable Halfsie offspring. Although she is not a member of the Aristocracy herself, she and children like her are raised with some of the benefits of the upper class. Xandry and her half-siblings were sent to school, and eacht ook a job as part of the security for the Crown and other nobles. God Saves the Queen begins with a death. Xandry's sister Dede, declared mad after the death of her baby, has been found dead by the officials of the asylum. And although the rest of the family is all too ready to mourn the death of their sister, Xandry refuses to believe that Dede would have killed herself. As she investigates the whereabouts of Dede in the days leading up to her commitment, the threads holding together Xandry's life begin to unravel. Those she has leaned on her entire life are cast into doubt, and the Goblins that are feared by every right-thinking citizen come to her aid. Xandry will need to decide who she trusts: her family, friends and teachers, or a band of outsiders and traitors to the Crown. Locke makes a valiant effort to bring this new mythology into the 21st century. It makes perfect sense that a nation ruled by centuries-old beings would be quite traditional in its fashions and societal norms. It also makes sense that technologies such as DNA sequencing and immunology would be more relevant in this alternate timeline and would be more advanced than we have now. The only flaw in this is that it's hard to tell exactly which segments of modern technology are actually present and what names they are given. This is a common flaw in many alternate timeline series, and while frustrating is accepted as par for the course. In short, God Save the Queen is a fanciful new take on the vampire/werewolf mythos and a charming addition to the 'bustlepunk' subgenre of steampunk. 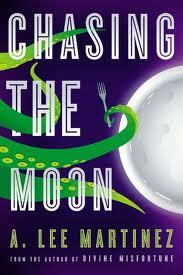 One also assumes that the world in which the story takes place will only be more fully defined in subsequent books. This is an entertaining story that leaves the reader eagerly anticipating the next volume. Highs: The betrayals, reversals and revelations come fast and furious at times, but are always believable and founded in some sort of pre-established fact. Lows: The odd combination of current-day technology with the Victorian overlay can be confusing at times, as can the rather convoluted bloodlines. Verdict: Hardly the epitome of alternative history or supernatural fiction, nonetheless, this is an enjoyable, engaging fiction. The best YA fiction makes the reader forget about everything else. With a quick opening, compelling characters and a clear black and white, good vs evil plot, it's a breath of fresh air from the shades of grey reality we all live in. 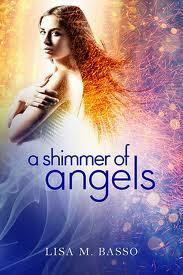 A Shimmer of Angels by Lisa Basso is just such a book. Clean enough for the most discerning of parent, yet compelling enough to keep an adult up tale rading, it's the perfect read for a snowed-in winter weekend. We start with Ray, a teen girl struggling to be normal. Since her mother's death, she's seen angel wings on the occasional stranger in public. Her father, perhaps a bit grief-stricken after the loss of his wife, turns this problem over to therapists, and eventually psychiatrists, and ends up with his elder daughter in and out of psychiatric hospitals with a schizophrenia diagnosis. Finally out, medicated to the gills and with more mental tics than when she went in, Ray is determined to have a normal high school experience. She has a best friend, a part-time job at a diner, and is keeping up with school. She's learned that normalcy is something to be cherished, and has a running tally in the back of her ind of how many days it's been since she's seen wings. Her carefully crafted new life starts to unravel when the wings come back. This time, they're attached to a new boy at school. Cam, short for Camael, starts out friendly enough, sitting next to her in History and trying to get to know her during lunch. He even befriends her best friend Lee in an attempt to get in her good graces. To Ray, however, Cam represents everything she's been trying to put behind her. She fully believes that the psychiatrist's diagnosis, and has internalized the idea that the wings are nothing more than her broken mind's attempt to come to terms with the loss of her beloved mother. She might be able to hide the fact that she's seeing wings again from her father, but not if she has to keep interacting with the subject of her delusions. Apparently a regular at the diner she's begun waitressing at, he's different than all the other winged people she's seen. Instead of glowing white wings, his are a luminescent black, that both absorbs the light and shine with an almost slippery sheen. And then the suicides start. 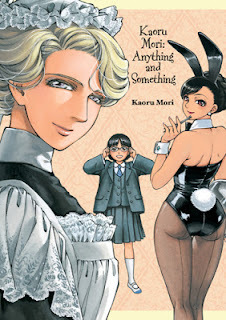 Now, with the help of two winged helpers that can't trust each other, Ray is the only person who can track down what's happening to her classmates. The only thing connecting the deceased students is a picture of a winged man that each draws before his death, and which has been haunting Ray's dreams. Will Ray be able to solve these deaths, protect the ones she cares about, and avoid being sent back to the SS Crazy in the process? Highs: From the hurt friend who doesn't understand why Ray has become so distant to the petulant younger sister, even the minor characters in this story react just as one would expect. Lows: While it makes sense that Ray would come out with a few new neuroses, it's hard to imagine that a 13 year old would be institutionalized for seeing non-destructive hallucinations, and that as a 16 year old, Ray would still see herself as crazy after she finds out the wings are real after all. Verdict: Despite a few plot hiccups, A Shimmer of Angels is a wonderful bit of escapism fit for both younger teens and their mothers. When last we saw Judge Nugan Bufan Sn, he was perhaps the happiest Judge in the Common Confederation. In a universe thousands of years old, most case law has been hashed out centuries ago. All judges get to do, especially in a backwater such as Earth, is apply the same statutes over and over again. Simply put, there's not much new under the suns. But as backwater is humans are, we can still be surprising. And by a strange twist of circumstance, Judge Sn actually got to create new law in The Android's Dream. Here, in 'Judge Sn Goes Golfing,' we get to see the person behind the robe. It turns out, Judge Sn isn't the nicest person off the bench, either. After his landmark case, he's still stuck on the provincial planet of Earth. In fact, now that his ruling has been accepted case law, he will forever be tied to the planet. Well, at least Earth has some decent golf courses on it. He'd know; he's been permanently banned from almost all of them. All he has left in the vicinity is a course that's so terribly planned, so badly maintained, and so badly managed that even the outcasts of the golf circuit can still get on the course. Poor golfing skills, combined with a bad temper has gotten him exiled to this disaster of a course. But even the worst golfers occasionally get an amazing round. And he'll be damned if he lets a few assassins get in the way of the game of his life. 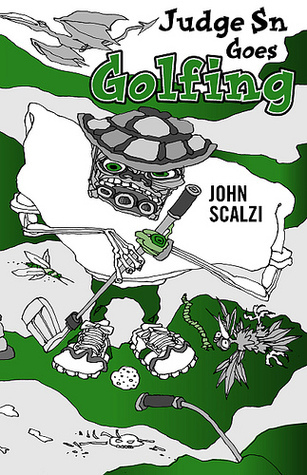 'Judge Sn Goes Golfing' doesn't add all that much to the universe of The Android's Dream. Rather, it feels like an unnecessary scene cut from an already full book. That doesn't make it any less fun to read, though, and fans of Scalzi's other works should enjoy this foray into the universe as well. Lows: I've seen what the rich and powerful can get away with, and it's a bit hard to believe that EVERY course has kicked Sn out, especially after the ruling. The introduction of sentient androids to the general population will be fraught with legal and ethical questions. What defines sentience? Can it be tested for? Does self-awareness come with rights that would supersede the ownership rights of its creator? 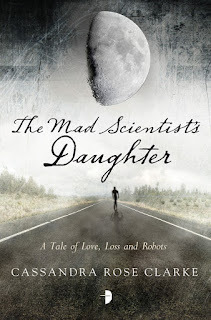 These dilemmas are part of the backdrop of Cassandra Rose Clarke's The Mad Scientist's Daughter. We meet Caterina Novak as a child. The daughter of a brilliant roboticist, she's had a carefree but isolated life. most of what she's learned so far has been overheard watching her father work in the laboratory downstairs. But one day, the family receives a new member. His name is Finn, and at first Cat doesn't know what to make of him. Tasked with being Cat's tutor along with his duties as her father's assistant, he is the first person Cat could truly call a friend. Cat's mother, however, is less than thrilled with how her daughter is being raised. She feels that Cat is growing altogether too attached to this...construct...and insists that she be enrolled in the town high school. For better or worse, at least Cat gets out among more normal people. But when ever she can, she still gravitates to her first companion. In fact, all throughout her life, Cat seems to loop back to her childhood friend. When an adolescent house party turns ugly, it is Finn she calls to rescue her. At her wedding, it is during her dance with Finn that she feels most contented. And later, back at her childhood home, it is Finn's room that holds the most memories. Can a girl, growing up with a robot for companionship, learn to have real relationships with messy, imperfect humans? Does an AI have the same right to the pursuit of happiness that a human has? Where did Finn, light-years more advanced than any other robot Cat's ever seen, come from? Clarke does a superb job pacing the novel, keeping the reader from becoming bored with the starving-artist-ennui that Cat faces in her 20s, and keeping the story centered on the growth of both Cat and Finn throughout their lives. Looking back at the book from the end, the subtitle on the cover - 'A Tale of Love, Loss and Robots' - is perhaps the most perfect description possible. Cat loses a lot throughout this book, but in the end, she gains perhaps the only life a mad scientist's daughter could live. Highs: Without giving too much away, the final scene in the book perfectly echoes the first scene, bringing a very satisfying conclusion to the story. Lows: Cat makes a lot of bad choices, for years, trying to find herself and it makes the reader want to slap her on more than one occasion. Verdict: As a science geek, I continually wanted more of the bioethics and robot rights subplot, but that would have been a different story altogether. 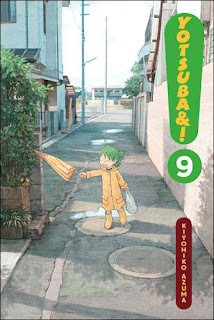 This story, of a slightly misfit young woman struggling to find her place in the world, is beautifully crafted as it is. Fairy tales weren't always Disney-inspired fripperies. Many of them were cautionary tales at their heart, or even just involving the dark side of the fantasy realm. 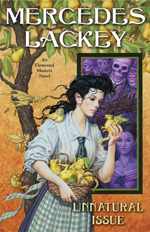 Mercedes Lackey's Elemental Masters series has certainly taken a turn towards these darker fairy tales at times, and returns there with Unnatural Issue, the sixth book in the series. While this is the 6th book in the Elemental Masters series, it is certainly accessible to first time readers of the series. While there are no real spoilers that I could tell, or anything beyond basic 'fantasy world magic' to know, there may be some that I missed, so be warned. Otherwise, read on.